When the Calder Cup playoffs begin later this week, the San Diego Gulls won’t be part of them for the first time in their three seasons in the American Hockey League. Needing only to send Saturday night’s game into overtime to get the one standings point they needed to qualify for the playoffs, the Gulls lost to Tucson Roadrunners , 6-3, in Tucson, Arizona, allowing the first three goals. “This is going to be one that I know is going to stick with me a long time,” Gulls coach Dallas Eakins said. “I cannot remember being this gutted, this disappointed in a very long time. “To go through 68 games and to need one point, and you’re going to think of those inches, those things that happened not only these last three games but the previous 65 before that. That’s why we preach every moment is critical, every day is a critical day. The Gulls needed one standings point in any of their final three games, all against the Pacific Division-champion Roadrunners, but lost all three in regulation. The Gulls (36-28-3-1) and San Jose Barracuda (34-26-4-4) both finished with 76 points. However, San Jose had 33 victories in regulation or overtime to 32 for the Gulls, the first tiebreaker. The Barracuda, the San Jose Sharks AHL affiliate, concluded the regular season with six consecutive victories, including a 2-1 victory over the Stockton Heat Saturday night. Stockton (34-28-2-4) entered Saturday’s game needing a victory to qualify for the playoffs. Instead, the Calgary Flames AHL affiliate ends the season sixth in the eight-team division, two points behind San Jose and the Gulls. The Gulls ended the season with three consecutive losses, six in their final seven games and seven in their last nine. Teams get two standings points for a victory — whether it is in regulation, overtime or a shootout — one for losing in overtime or a shootout and none for a regulation loss. Tucson opened the scoring on its first shot, as Lawson Crouse tipped in a drive from the point by Trevor Murphy for a power-play goal 13:20 into the first period. The Roadrunners (42-20-5-1) increased their lead to 2-0 with 5.8 seconds left in the first period when Michael Bunting scored his team-lead equaling 23rd goal off backhand pass from behind the net by left wing Zac Larraza. Left wing Tye McGinn scored 2:00 into the second period in his 400th professional game, off assists by Murphy and defenseman Jordan Gross, who was making his professional debut after completing his college career at Notre Dame April 7 by playing in the Fighting Irish’s 2-1 loss to Minnesota Duluth in the NCAA men’s final. The Gulls began their comeback attempt 10:41 into the second period when Nic Kerdiles tipped in a shot from the point by Jacob Larsson for his 15th goal of the season. The Gulls cut the lead to 3-2 4:27 into the third period when Kalle Kossila, who turned 25 Saturday, flipped the puck over Tucson goaltender Hunter Miska. The Roadrunners regained a two-goal lead with 8:44 left when a pass by Tucson left wing Trevor Cheek caromed off Gulls defensman Keaton Thompson into the net. The Gulls again pulled within a goal with 6:51 remaining on Kossila’s 21st goal of the season, tying the team record in its three seasons in the AHL. Corey Tropp and Antoine Laganiere both scored 21 goals in the 2016-17 season. Larraza scored an insurance goal with 3:22 to play and Cheek added an empty-net goal with 59 seconds left, off an assist by Gross, before a crowd at Tucson Convention Center Arena announced at 6,092. Larraza scored two goals in his 11 games with the Roadrunners, the Arizona Coyotes, AHL affiliate, both against the Gulls. The first came in the season opener Oct. 7. Larraza played 29 regular-season and two playoff games for the Gulls over their first two seasons in the AHL. The Gulls league-leading power play was held scoreless in its four opportunities, including a two-man advantage for 1:17 in the second period. 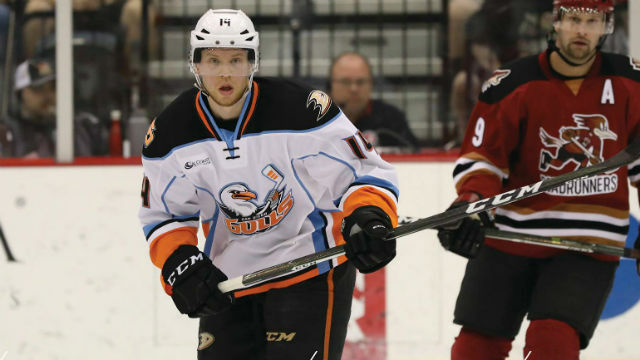 The Gulls, the Anaheim Ducks AHL affiliate, killed two of Tucson’s three power-play opportunities. The Gulls led in shots, 26-25, including a 14-13 advantage in the third period. Berra (16-12-2-0) stopped 19 of the 24 shots he faced in his fourth consecutive loss. Miska (22-9-0-0) made 23 saves. “I just feel absolutely terrible for our fans that have been behind us the whole time and I really feel like we’ve let them down,” Eakins said.